One of the hardest jobs of being a parent is getting your child to eat, especially healthfully. Some kids are no problem at all, while others are as picky as they come. As a mom, I’ve made it my mission to provide healthy and tasty choices for my daughter. I know there will come a day when I will no longer have control over food choices in her life. This is why starting early and setting a good example is so important. 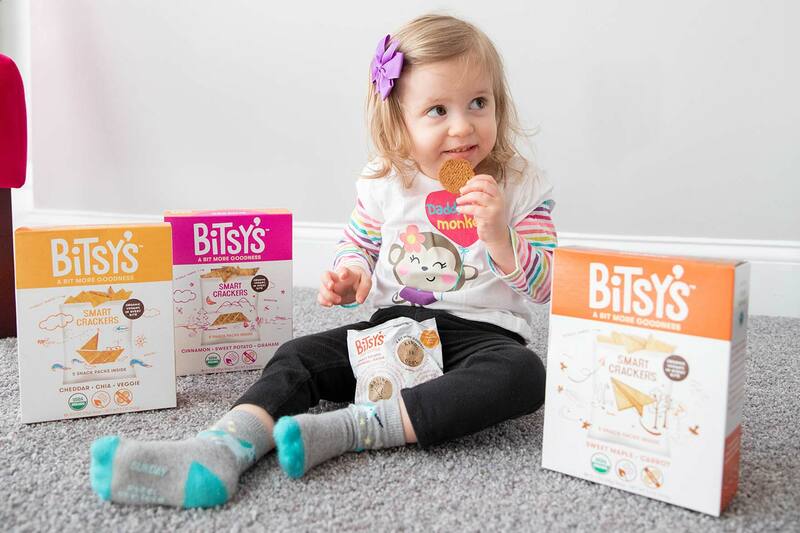 Eating healthy, organic and GMO-free foods can be yummy and fun – Bitsy’s Brain Food makes snacks that offer just that! 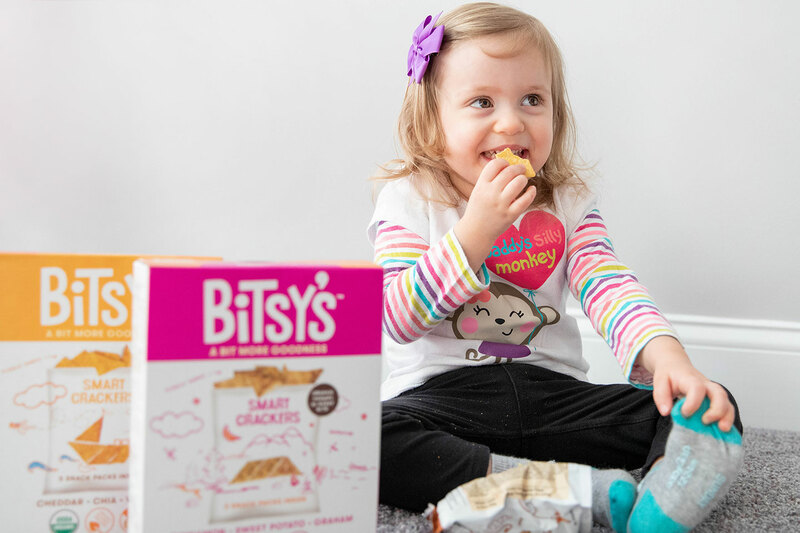 Bitsy’s Brain Food, a line of smart snacks, makes bite-sized treats packed with the good stuff to help support developing bodies and brains. Packaged with educational content, these snacks are full of vitamins and Omega-3. Founders, Maggie and Alex, discovered a mutual lack of healthy options for their children in their everyday lives. This inadequate supply of options led them to create the line Bitsy’s Brain Food. Their mission is to empower and teach kids to WANT to eat WELL. They’re motto is “Eat Smart, Be Smart”. Bitsy’s Brain Food strives to get children excited about vegetables and fruits by making learning about nutrition fun, so they crave the right foods. Bitsy’s Brain Food just recently launched a product called Smart Crackers. These organic crackers come in puzzle piece shapes, offering a creative and fun way for children to use their imagination, all while enjoying a tasty treat. What makes Bitsy’s Brain Food so special is that they’re made with a half serving of vegetables per serving, which is really unique. I don’t think any other product out there for kids in terms of a cracker has that much vegetable baked into it. Can you say MOM WIN? Organic snacks, made with veggies. 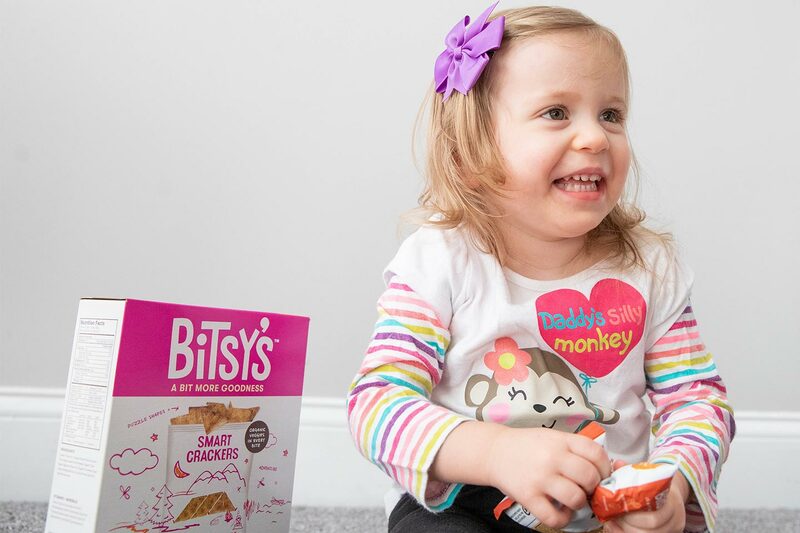 After trying Bitsy’s Brain Food, my daughter really loves them all – so do I! Her favorite is a tie between the Smart Crackers Sweet Maple and Carrot flavor and the Cinnamon, Sweet Potato and Grahams. I agree with my daughter, the Sweet Maple and Carrot is fantastic. The maple is definitely the dominant flavor and happens to be a staple in our home. I also love the Good Cookies! Not only are they super tasty, but they come inscribed with positive and encouraging messages. A few say things like: Imagine, You Rock, Kind is Cool. How great is that? I’m such a fan of an optimistic attitude and truly believe it’s so beneficial for our little ones to hear and adapt. Kids love to snack, and it seems mine does all day long. Unfortunately, there are many snacks out there that offer empty calories and are packed full of processed, artificially flavored, modified junk. I’m so glad I found Bitsy’s Brain Food, or rather they found me. They really are a perfect, healthy snack! One of my favorite things about their products is they contain vitamins such as: Vitamin A, B6, B12, C, D, Zic, Iron. They’re Organic, GMO-free, Vegan and Kosher and are packaged in kid-friendly & fun boxes!! These snacks are awesome for an at-home or even on-the-go snack! So what are you waiting for? Go try them! What are some of your go-to snacks for your kiddos? Disclaimer: I was given items in this post for the purpose of a review. I was not paid in any way to write this review. All opinions are my own as always, and I would only recommend products I would use myself. I love that too! Thanks for taking a read!